Tickets are, by nature, ephemeral things. Nonetheless, they can hold special and enduring significance, viscerally anchoring us to a place and time and reminding us of something special. 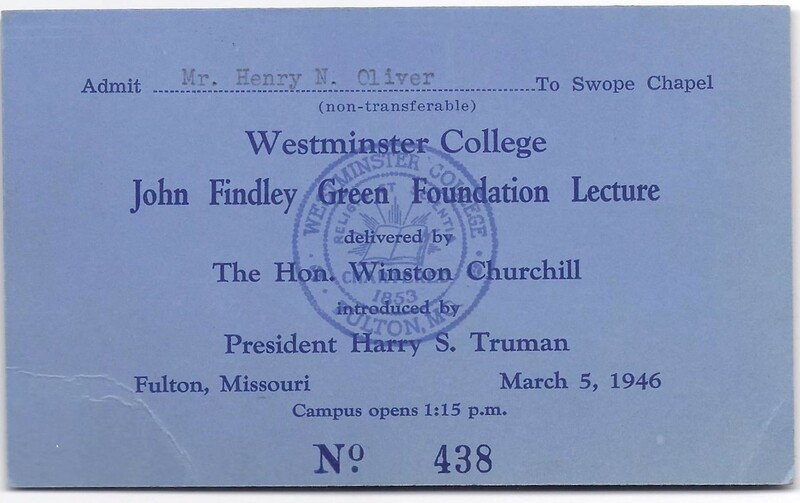 One such place and time worth remembering occurred just over 70 years ago in Fulton, Missouri, when Winston Churchill gave a famous speech at Westminster College. 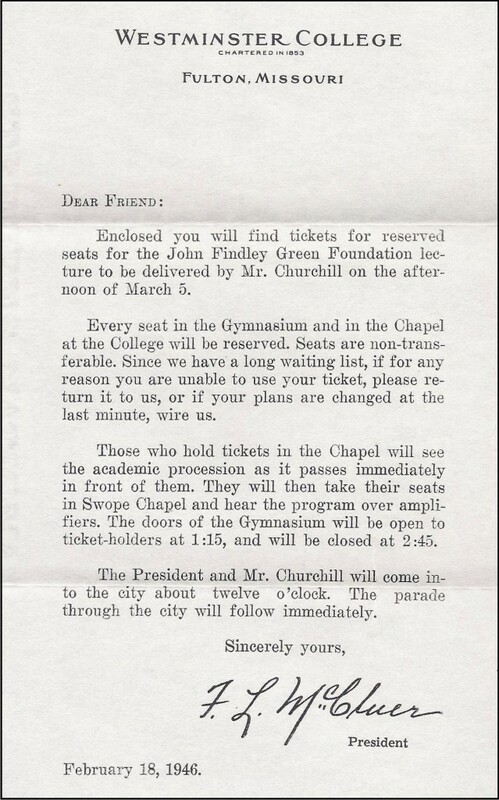 We were very pleased recently to offer an original ticket and letter of invitation to this speech, and more pleased still at where it ended up, strengthening the common cause about which Churchill spoke that day, and which was a central feature in his long life. This blog post tells the story. Then-President Harry S. Truman traveled with Churchill by special train from Washington D.C. for the twenty four hour overnight journey to Jefferson City, Missouri specifically to introduce Churchill in Fulton. With them was Fleet Admiral William D. Leahy. During the journey, the three men discussed recent Soviet provocations in northern Persia and Turkey. “During the morning of March 5, as the train continued westward along the Missouri river, Churchill completed his speech for Fulton. 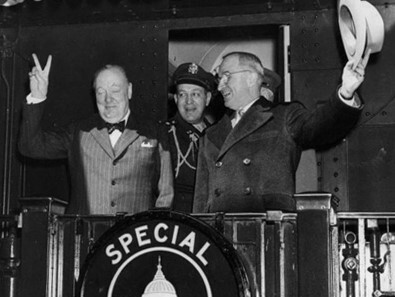 It was then mimeographed on the train, and a copy shown to Truman” who told Churchill that he “thought it was admirable” and “would do nothing but good, though it would make a stir.” (Gilbert, Vol. VIII, pp.196-197). Upon arriving in Jefferson City shortly before noon on March 5, Churchill, Truman, and Leahy drove to Fulton, where they met and lunched with Dr. Franc L. McCluer, the College president, before the academic procession and delivery of the speech. Though the subject of the speech was of utmost gravity, Churchill began with characteristic wit: “The name ‘Westminster’ is somehow familiar to me. I seem to have heard of it before.” The speech was broadcast throughout the United States. Though it is difficult to understand how the holder of this ticket could choose to leave it unused, we can be glad that he did. We were able to provide this ticket to Lee Pollock of The Churchill Centre. And just a few weeks ago Lee presented the ticket and letter to British Ambassador Sir Kim Darroch, who assumed his post in January of this year. The Churchill Centre had partnered with the British Embassy in Washington to create a program entitled “What’s Next for the U.S. – U.K. Partnership?” Following the program and discussion, Ambassador Darroch hosted a celebratory dinner for guests “including senior staff of both Embassies, representatives of the U.S. State Department and selected foreign policy organizations in Washington. After toasting both Ambassadors with Churchill’s favorite Pol Roger champagne,” Lee presented Ambassador Darroch with the framed original ticket and letter we provided to The Churchill Centre. It was a wonderful way to commemorate both the 70th anniversary of the speech and the relationship that does, should, and must endure. The unity of the English-speaking peoples, particularly Great Britain and the United States – was in many ways Churchill’s political and literary life’s work. Britain’s acute dependence upon the United States during and after the Second World war is well known and very much born of necessity, but Churchill’s conception of what became the ‘Special Relationship’ had roots far earlier in Churchill’s life than the Second World War. The cultural commonality and vitality of English-speaking peoples animated Churchill from his Victorian youth in an ascendant British Empire to his twilight in the midst of the American century. 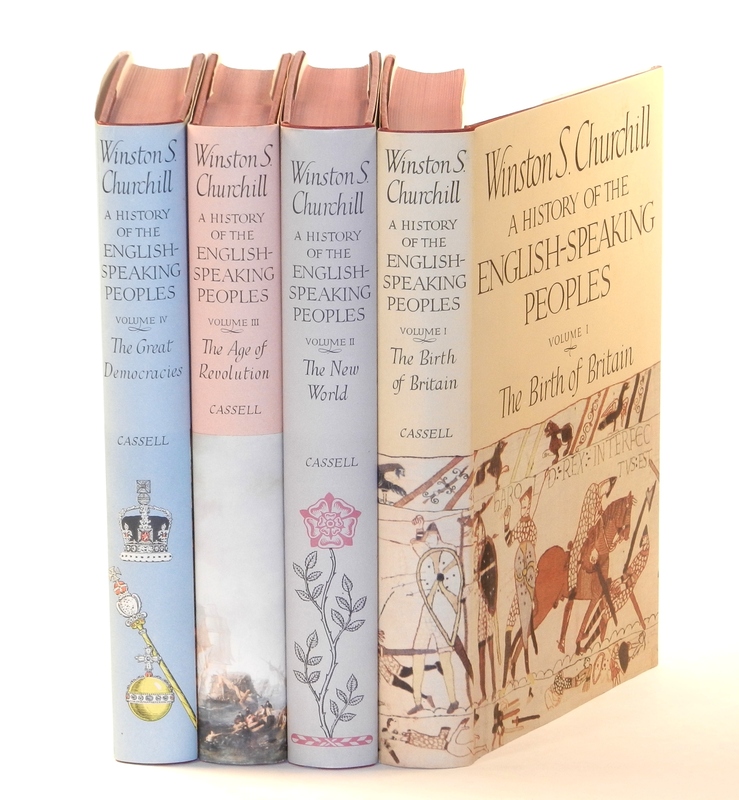 In fact, Churchill’s great four-volume work, A History of the English-Speaking Peoples, was actually drafted in the 1930s. Fittingly, the half a million word draft was set aside when Churchill returned to the Admiralty and to war in September 1939. The war would, of course, pivot on an unprecedented alliance among the English-speaking peoples – an alliance Churchill personally did much to cultivate, cement, and sustain. 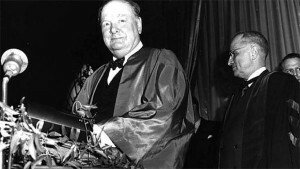 Among the English-speaking peoples, Churchill considered Britain and the United States in particular “united by other ties besides those of State policy and public need.” During a wartime speech at Harvard, among the “ties of blood and history” Churchill cited were, “Law, language, literature – these are considerable factors. Common conceptions of what is right and decent, a marked regard for fair play, especially to the weak and poor, a stern sentiment of impartial justice, and above all the love of personal freedom, or as Kipling put it: ‘Leave to live by no man’s leave underneath the law’ – these are common conceptions on both sides of the ocean among the English-speaking peoples” (6 September 1943 speech at Harvard University). It was of course an emerging great global threat to freedom and rule of law in the form of the ambitions of the Soviet Empire that animated Churchill’s speech 70 years ago in Fulton, Missouri. 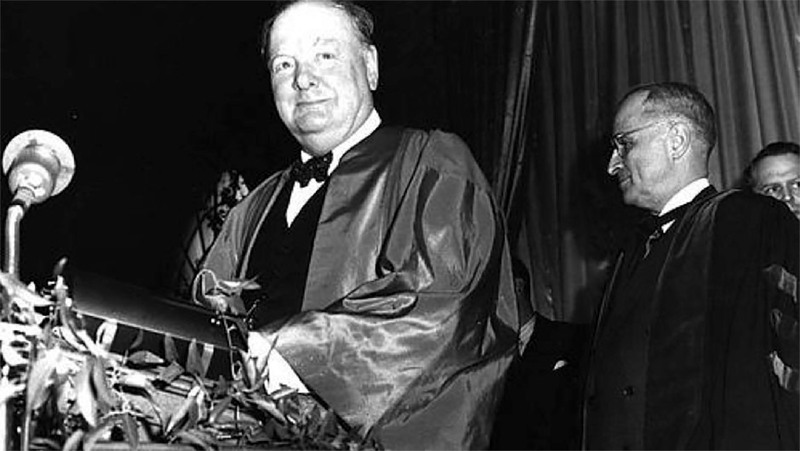 The reinforcement and constructive application of the common conceptions of the United States and Great Britain – upon which so much of 20th Century history hinged – would continue to the very end of Churchill’s life and career. Indeed, Churchill’s aspirations for this ‘special relationship’ are encapsulated in the title of his last published book of speeches in 1961, The Unwritten Alliance. We are pleased that our own special relationship with The Churchill Centre made this gift possible, and we hope that, in some small way, it serves to bolster and perpetuate the special relationship between the two nations Churchill held most dear. If so, it will prove a very special ticket indeed. We have just catalogued an inscribed book worthy of attention. 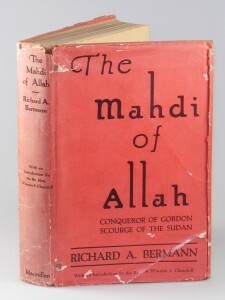 This is a jacketed U.S. first edition of The Mahdi of Allah by Richard A. Bermann, a notable presentation copy, tying together three men – the author, the author of the book’s Introduction, and the person to whom this copy was inscribed. All three men would all be dramatically affected by the political ascendance of Hitler a year later. 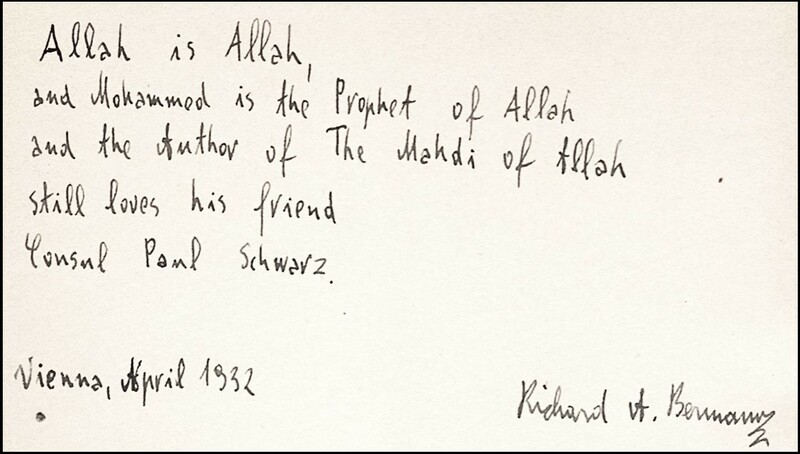 The author’s intriguing inked inscription on the front free endpaper verso in 7 lines reads: “Allah is Allah | and Mohammed is the Prophet of Allah | and the author of The Mahdi of Allah | still loves his friend | Consul Paul Schwarz. | Vienna, April 1932 | Richard A. Bermann”. The recipient of this inscribed presentation copy, Paul Schwarz (1882-1951), was a German diplomat notable for being removed by Hitler as German Consul General in New York and for publicly criticizing the new Nazi regime. Hitler became Chancellor on 30 January 1933 and consolidated dictatorial powers by late March. In early April, Paul Schwarz became one of two diplomatic officials in the United States to be removed by Hitler (along with the German Ambassador). “Of the two, and in fact, of all the German foreign service, only Schwarz was moved to disaffiliate himself publicly from the Nazi regime.” (Paul Seabury, The Wilhelmstrasse: A Study of German Diplomats Under the Nazi Regime) “I am at odds with the bigoted policies of the new regime” Schwarz told American newspapermen on April 11. “I feel honored for I am the only German consul to be dismissed by Hitler as far as I know.” It is noteworthy that Schwarz was reportedly not Jewish. His expulsion has been partially attributed to his entertaining Professor and Mrs. Albert Einstein at tea in his private residence. After his resignation, with his diplomatic passport now worthless, Schwarz went to Montreal and returned to become an American citizen as an ordinary immigrant. Schwarz was offered employment as an investment counselor with Harlle & Steiglitz “despite the fact that he had never seen a stockmarket ticker.” Schwarz would later supply information about the Nazi regime to the Office of Strategic Services (OSS, the forerunner of the CIA) after it was created in 1942. The author, Richard Arnold Bermann (1883-1939), shared his friend’s sympathies and, ultimately, his exile. Bermann was a Viennese writer and leading journalist in the German-speaking world who first rose to prominence using the pseudonym Arnold Höllriegel. Bermann became known for his articles in Der Tag and other journals, which included his observations on places such as Egypt, Palestine and Brazil. 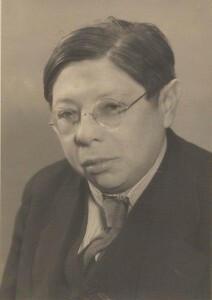 After the National Socialist takeover Bermann was dismissed from the Berliner Tageblatt because of his Jewish heritage, and his writings were banned by the Reichsschrifttumskammer (Reich Chamber of Literature). He became a co-founder of the German Academy in Exile, established in 1936 as a platform for German intellectuals in America to speak out against Hitler. Berman eventually escaped Germany, arriving in London in June 1938 and then emigrating to New York. Up to his death in 1939, he remained intensively engaged in the work of the American Guild for Cultural Freedom. 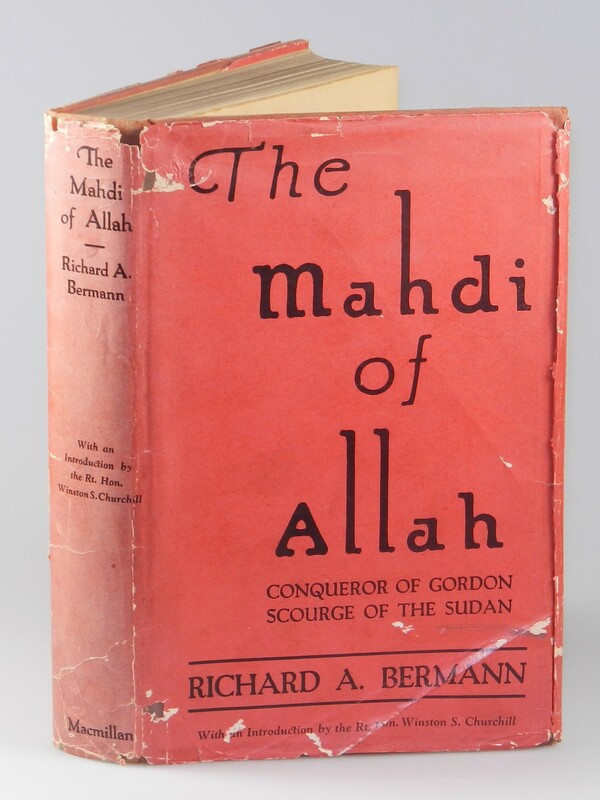 The Mahdi of Allah, originally published in Bermann’s native German, is, as the author’s subtitle describes, “The Story of the Dervish Mohammed Ahmed.” Mohammed Ahmed was a messianic Islamic leader in central and northern Sudan in the final decades of the 19th century. Claiming that Allah had selected him as the true Mahdi, he found fertile political ground in the inhabitants’ resentment engendered by the corruption of and oppression by Egyptian rulers who had long dominated the region. Economic and political problems in Egypt further strengthened the Mahdi’s hand, enabling the Mahdi’s forces and followers to occupy most of the Sudan. In 1883 the Mahdists overwhelmed the Egyptian army of William Hicks, and Great Britain ordered the withdrawal of all Egyptian troops and officials from the Sudan. In 1885, General Gordon famously lost his life in a doomed defence of the capitol, Khartoum, where he had been sent to lead evacuation of Egyptian forces. Though the Mahdi died in 1885, his theocracy continued until 1898, when the British general Kitchener reoccupied the Sudan. With Kitchener’s forces was a very young Winston Churchill, who would participate in the battle of Omdurman in September 1898, where the Mahdist forces were decisively defeated. The young war correspondent and British cavalry officer Churchill would write his second published book – The River War – about this British campaign in the Sudan. 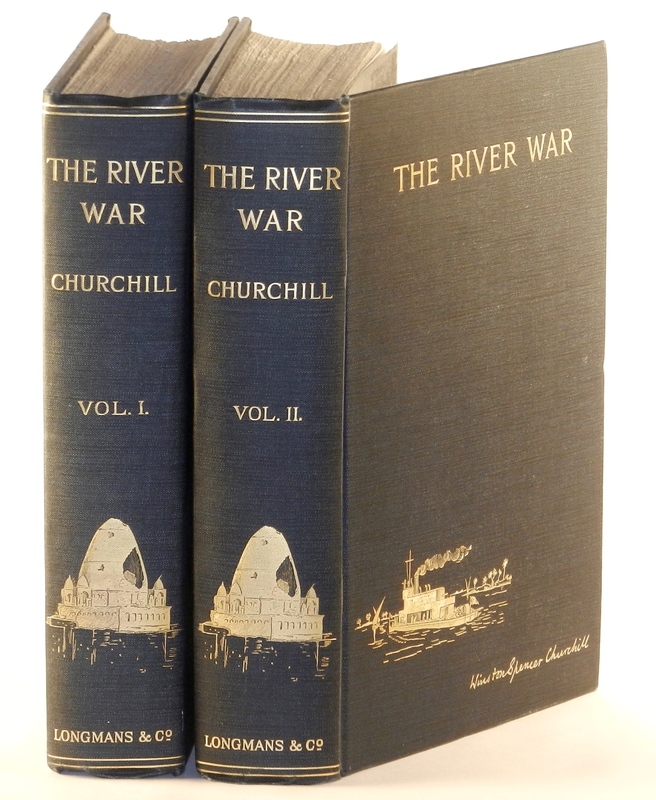 In The River War, Churchill was unusually sympathetic to the Mahdist forces and critical of imperial cynicism and cruelty – so much so that the 1902 second edition of his book excised much of his politically imprudent criticism about Kitchener. 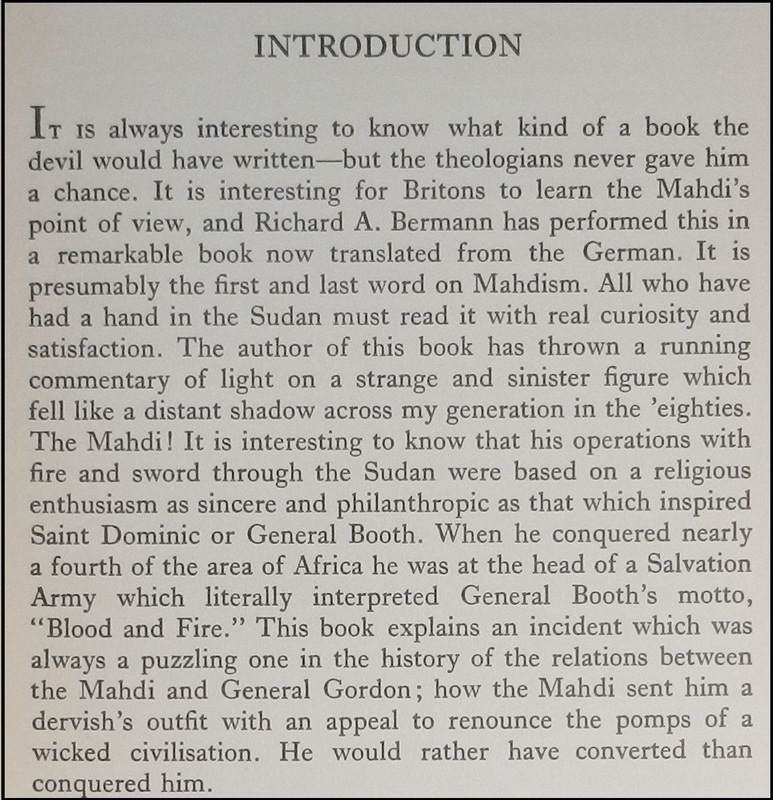 In 1931, Churchill wrote a four-page introduction for Bermann’s book sympathetic to the Mahdi, showing the same broadminded comprehension he had three decades earlier when he fought the Mahdi’s forces and wrote The River War: “It is interesting to know that [the Mahdi’s] operations with fire and sword through the Sudan were based on a religious enthusiasm as sincere and philanthropic as that which inspired Saint Dominic or General Booth.” This work is translated from the original German and Churchill’s introduction appears only in the British and U.S. editions. 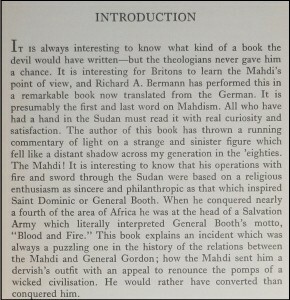 Interestingly, the British first edition bears a tipped in slip after the copyright page printed in bright red ink disavowing acknowledgement of “the claim of the Dervish Mohammed Ahmed to the sublime title of ‘The Mahdi of Allah'” in order “To avoid the possibility of causing offence to Mohammedan readers”. No such disclaimer appears in this U.S. edition, published in a country with perhaps both more robustly permissive free speech and less sophisticated cultural sensitivity. This U.S. first edition features a substantial introduction by Winston Churchill and, as such, has been catalogued by Churchill’s bibliographers (Cohen B47.2, Woods B17). The U.S. edition is scarce in the original dust jacket and this copy is the only U.S. edition of which we are aware that is both jacketed and inscribed.